The fiery H. Rap Brown, chairperson of SNCC, minister of justice for the Black Panther Party and one of the original four targets of the FBI’s infamous COINTELPRO to neutralize Black power, is presently entombed in the federal prison at Florence, Colorado, one of the world’s 10 worst prisons. Pursued relentlessly since the ‘60s, he was wrongfully convicted in 2002 of shooting two deputy sheriffs – the prosecutor bragging that they finally got him after trying for 24 years. 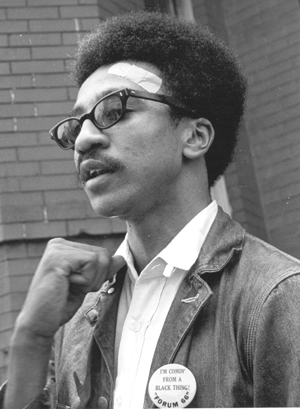 In 1967, fiery speaker H. Rap Brown was elected chairperson of SNCC, the Student Nonviolent Coordinating Committee, succeeding Stokely Carmichael. The government has been trying to silence him ever since. Now a campaign is underway to demand proper medical care for recent severe health problems, his transfer to a facility closer to home in Atlanta – where, in the ‘70s, as Imam Jamil Al-Amin, he founded a mosque and has since demonstrated how to revitalize a Black community – and his ultimate freedom. His wife, attorney Karima Al-Amin, who has been with him since the ‘60s, tells his story on the Block Report. Listen to the interview at https://soundcloud.com/blockreportradio and read the transcript here. Minister of Information JR: Today we’re going to be talking about the prisoner, the Imam Jamil Al-Amin, formerly known as H. Rap Brown. Our guest is his wife, lawyer Ms. Karima Al-Amin. Ms. Karima, can you tell the people a little bit about the history of your husband before he became Jamil Al-Amin? 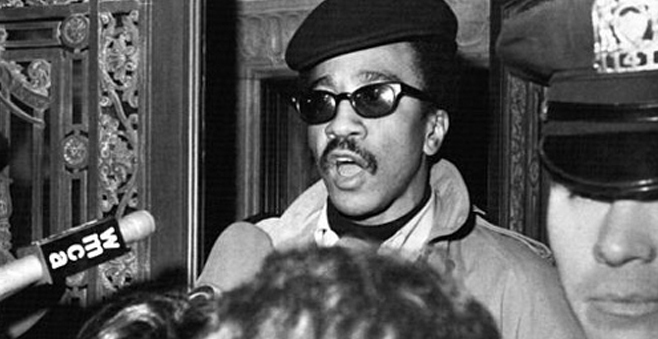 Can you tell us a little about his history as H. Rap Brown? Karima Al-Amin: Well, you know in 1967, in fact May 1967, he was elected chairperson of SNCC, the Student Nonviolent Coordinating Committee, and he succeeded Stokely Carmichael, who became Kwame Ture. 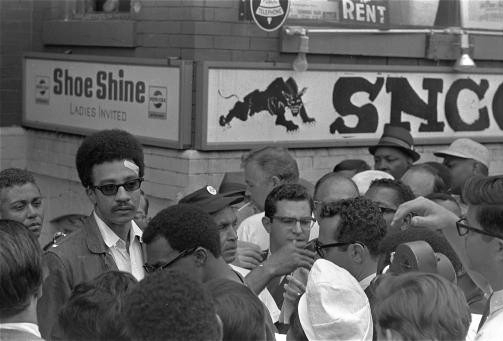 So when he took over SNCC in May 1967, the organization was and had always been dealing not only with civil rights but human rights, and it was an organization that had always promoted fighting against oppression and improving the conditions of African Americans, but they also concentrated on global issues, especially back then. I remember in 1967 they were supporting Nelson Mandela and ANC (African National Congress) and the armed struggles that were going on throughout the continent of Africa. So he was not only a national figure but he was also an international figure. And as such the U.S. government and also, under the directorship of J. Edgar Hoover, the FBI had instituted in August 1967 the COINTELPRO program, which targeted four organizations and five individuals. The initial targets were my husband as H. Rap Brown, Stokely Carmichael, Elijah Muhammad, Martin Luther King and Max Stanford, and the four organizations were SNCC, SNLC, The Nation of Islam and RAM (Revolutionary Action Movement), which Max Stanford headed. So under that program, and we know what has happened under that program: It was an effort to neutralize leaders and organizations, to pit them against each other, to destroy the movement. And essentially it was successful, because there were assassinations; there were killings. They hauled my husband in and out of jail to make sure that he was not on the outside to speak as he was going around the country speaking. So that was his background. He’s from Louisiana and he had always witnessed the inequities and he was committed to make a change. M.O.I. JR: Why did he get the nickname “Rap”? Karima Al-Amin: Well, he was always known to do exactly that: rap. When I was growing up we would always, when someone was talking and speaking and doing what’s called “playing the dozens,” that meant that they could rap. His ability to use words and make those words very potent – that became known as rap. M.O.I. JR: Can you tell us a little about the history of the H. Rap Brown law? Karima Al-Amin: In February 1968 my husband went out to California to a rally. It was a Free Huey Newton rally. He was there, with Stokely Carmichael and James Foreman, representing SNCC, and at that time it was announced that each of them would have a title. My husband became minister of justice for the Black Panther Party, and that was an effort really to show unity between the organizations and also within the movement. When he came back from there in February 1968, he was arrested because they said he went out there to California without having permission from a judge in New York City because he was essentially under house arrest. So he was in jail when Martin Luther King was assassinated in April 1968. Because of all of the protests wanting to get him out of jail, he was released. But two weeks after that, Congress – who had been calling for he and Stokely Carmichael to be thrown in jail and the keys thrown away – the Congresspeople, or representatives, voted to make an amendment to the Fair Housing Bill. It was passed in April 1968, a few weeks after Martin Luther King’s assassination, and it was called the Rap Brown Amendment, which is still on the books. It made it a felony to cross state lines or send telegrams – at that time telegrams or any modes of communication – to speak with the intent to cause a riot. As a result of the Rap Brown Amendment passed in April 1968, there were about 80 convictions, I believe, after that. 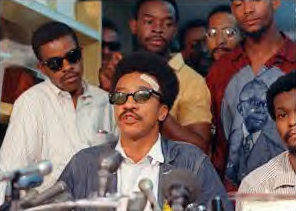 The first group charged under the Rap Brown Amendment was the Chicago 8 – as in seven plus Bobby Seale – Wounded Knee, the Native Americans, all the anti-war protests. So it’s a host of cases that we know of. But I didn’t even realize that was the law that they used to charge so many of the anti-war and the freedom fighters. M.O.I. JR: Can you talk a little about his transition to Islam and his life as a political prisoner prior to when he became a Muslim? Karima Al-Amin: Well, essentially he’s always been a political prisoner, although he does say that’s he’s not a prisoner of war, but he’s a prisoner at war. But he’s always been a political prisoner because of the targeting of this government against him. He was arrested after being sought for 19 months. In March 1970 he did not appear for the trumped-up charges of inciting a riot in Cambridge, which stemmed from his speech in July 1967. The interesting thing about that case: It was a case that they convicted him on to serve five years in prison and then later on it was dismissed because one of the Watergate writers and investigative reporters, Bob Woodward, revealed that those charges were trumped up. He did not appear for a trial in Bel Air, Maryland. At that time, two SNCC workers, Ralph Featherstone and Che Payne, were blown up in a car bomb explosion and he did not appear for that trial. And as a result of that, they put him on the Ten Most Wanted List and he was not seen for 19 months. Then he was he was captured in New York City and shot by a policeman and then he went to Rykers Island, which is one of the, I just read, one of the 10 worst prisons in the U.S., or jails actually; that’s what it is, a jail. So when he went there, there were brothers in the Muslim movement who would have him – he would go to classes with them and what would happen, he would then go to classes and then he converted. He became a Muslim in December 1971 when he was in Rykers. And that was the beginning of his conversion. M.O.I. JR: Can you talk a little about the communities that your family helped to create in Atlanta and his role as a Muslim imam? Karima Al-Amin: OK. When he got out of New York State Prison in October 1976, I had moved already here to Atlanta and we were able to get him paroled here to Atlanta. As soon as he came out – that was October 1976 – the next month, November 1976, we made Hajj; the two of us went to Saudi Arabia for the pilgrimage that Muslims make. And he started immediately identifying a neighborhood or location in Atlanta where we could form a Muslim community, and that’s what we did. 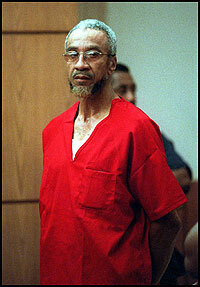 By July 1977, he had formed a Muslim community in the West End area of Atlanta, Georgia. When we got into the neighborhood, the neighborhood was what people would consider typical of a lot of the urban areas: It was just littered with activity with drugs and prostitution and drive-by shootings. And as a result of his efforts and the efforts of the brothers and sisters of the community, we were able to actually purchase houses in the area where Muslim families would move in to. And then we were able to pull up and he was able, singlehandedly almost, along with the members of the community, to clean up the area. M.O.I. JR: Before we get into his current case, can you talk about why the police would have a problem with someone like the Imam cleaning up a neighborhood like the West End of Atlanta? I mean many people would think that the police would appreciate the work that Imam Jamil Al-Amin was doing. Why was it to the contrary? 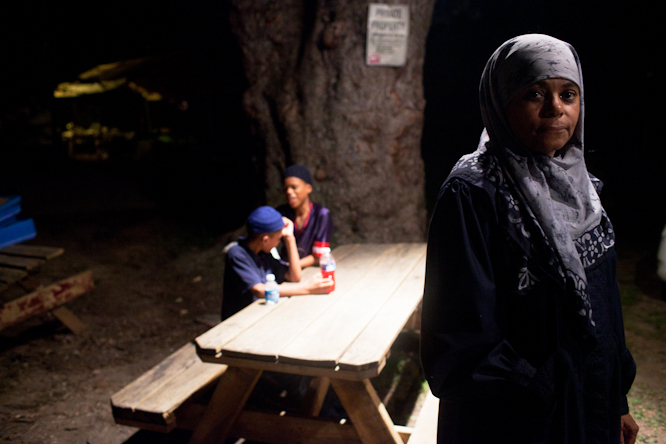 Karima Al-Amin: Well, because we maintain and it is true that even when we started the community – and throughout the years it was known that the community or the neighborhood was changing to be a better neighborhood not only for Muslims but for everyone living there – no matter what, he was still a target of the FBI, even though you would think that the officials would be happy about it. I know that Andrew Young was happy about it. His daughter moved right there in the community within a few steps maybe or yards from the mosque, and he was very happy that she was there because he felt that she could be very safe there. But in the meantime, we always had – and we’re seeing this in our discovery and the documents from the FBI; I have a request in now to the FBI and they said that they would release 22,000 pages of documents that they have on my husband – other forces that went beyond Atlanta police or Atlanta officials that were really dictating how my husband would be treated. When we look at the documents, they were planning so many stings, trying to get him on every possible charge that they could. And when we look at the documents, we see that they were actually saying, well, this did not work, so let’s try this. So we had something that was a little greater than just the Atlanta area. He was traveling internationally; he had made so many contacts that people from around the world and people within this country were contacting him. In many cities, communities were trying to replicate what was being done here. So they considered this very, very threatening. Also, Islam back then, like it is now, is so misunderstood. It’s a continuous effort to get the people in this country to view Islam and Muslims as the newest boogey people, like the boogeyman, and that everyone should be afraid of Muslims. So that was the backdrop that we were faced with. So naturally everyone should have been happy – and local people were happy in the community that he was cleaning up the community – but he was considered and is still considered a threat to this country. He’s still being punished for the 1960s, and I don’t think I can make it any plainer than that. He is still being punished by this government. He was considered and is still considered a threat to this country. He’s still being punished for the 1960s, and I don’t think I can make it any plainer than that. He is still being punished by this government. The prosecutor in the Atlanta case after the conviction said after 24 years we’ve finally gotten him, which means he was counting back to the day when he walked out of a prison in New York City. So this case in Atlanta – and I think we’ll probably get to it – but this case in Atlanta was and is an extension of the targeting. M.O.I. JR: Well, let’s just start right there. What is the case that he caught in Atlanta? I think it was 2000, 2001. Or should I say the case they pinned on him. Karima Al-Amin: Right. It was March 2000. Actually in May 1999 he was caught coming out of a restaurant driving a vehicle with a drive-out tag. Drive-out tags were legal then and they’re legal now. Once a car is purchased, then you don’t have a tag because you have not actually obtained one yet, but it’s a drive-out tag with the name of the person you got it from. Imam Jamil is not only a hero to Black people everywhere but to his loving and devoted family, who fight unceasingly for his freedom. He was stopped, which was not considered a valid stop, but he was stopped; and when he was stopped, apparently they looked up the vehicle and said the vehicle had been reported stolen, which naturally he did not know. Then with that charge, he was let out right away, but it was scheduled for court in January 2000; it happened May 1999. By January 2000 it was scheduled to go to court. There was a snowstorm and his case may have been called, but he did not know when it was going to be called. Apparently by March – this was a couple of months afterwards; that was January – by March, the county where he was arrested with this vehicle charge, the county had put out a warrant for his arrest for not showing up for the court appearance. And a week before the incident – the incident occurred March 16 – but apparently a week before, some of the sheriff’s deputies said they would go ahead and pull the warrant. They had gone out to the area, so they say, to arrest him because of this warrant. March 16 at 10:00 at night, they apparently appeared in front of the store to try to arrest him. It’s so complicated and I’m trying simplify it as much as I can, and I hope I’m not leaving out some of the important parts. But at least what we know is that one of the sheriff’s deputies ended up being killed and the other one being shot. The one who was shot was the one who said that the Imam was the one who did the shooting, and he had the Imam as having gray eyes. The description that evening changed – the height changed, the clothing changed – but these gray eyes were always the eyes of the Imam. But actually he does not have gray eyes, so the description was off. The surviving sheriff’s deputy and the one who died, before he died, he said that they knew that they had shot the perpetrator. And naturally, when the Imam was arrested four days later in Alabama, in Whitehall, Alabama, there was no indication of any physical injuries on him. So we did go to trial in 2002 and the jury was being selected. They were supposed to be selected Sept. 12, the day after Sept. 11, 2001, so it was against that whole background that this trial was taking place. And as a result, the jury convicted him of the charges, even though now, what we’ve found out afterwards, is that there was someone who confessed to it. We’ve done an investigation. The trial attorney that the Imam had did not do the investigation that should have been done as far as his confession is concerned, so now we are at the stage of a federal habeas, and that certainly is part of our argument. The easiest way for me to explain the case it that it just stinks, from top to bottom, and throughout it all the Imam has maintained his innocence. And based on that and based on the information that we do have after trial, we’re moving along with every possible appeal that we can do to bring out the wrong that was done. The easiest way for me to explain the case it that it just stinks, from top to bottom, and throughout it all the Imam has maintained his innocence. The major thing, No. 1, is not only the confession but the actual lying about the Imam’s description too. He does not fit that description; therefore, the deputy must have seen someone else. M.O.I. JR: Can you describe the description, because the Imam has a very distinct description? Can you just describe how the Imam looks vs. the description – you know, give us a few characteristics so the people can see how off it was? Karima Al-Amin: Well, he’s 6 feet 5 inches; his eyes are brown. One interesting thing is on the warrant the surviving sheriff’s deputy said he had no idea who he was. He said he was 28 at the time. I thought he was in is 40s, but apparently he was about 28, and he said he had never even heard of H. Rap Brown or Jamil Al-Amin. Black Agenda Report managing editor Bruce Dixon writes: “(U)pon his release (from prison in New York), Jamil Al Amin moved to Atlanta in 1976. In the same spirit that guided his earlier political and human rights work, he set about organizing and community building in Atlanta’s West End. He studied languages and traveled to the West Indies and the Middle East, to India, Pakistan and Africa. He taught, learned and led by example, becoming Imam Jamil Al Amin, an internationally acknowledged leader among U.S. Muslims. Along the way, he started several small businesses including a grocery store and helped organize youth sports, anti-drug and anti-violence campaigns.” Here he is at home in the hood. But on the warrant it said that his eyes were gray. So at the trial, this deputy got on the stand and said that his grandmother had told him always look a person in his eyes. And he looked him in his eyes and saw his gray eyes. Now the Imam always wears glasses. Even if this officer had looked in his eyes, he said nothing about glasses, but he said he knows for certain that his eyes were gray. The description also: He (the shooter) was a shorter person and the clothing that they described changed over the days. And so when he (the Imam) was arrested and when he saw the clothing that he had on him, then (the description of) the clothing from that evening changed. So that’s why I said the entire, the ENTIRE case – and I don’t have a better word – it is just a travesty. M.O.I. JR: Can you talk about Georgia moving the Imam to basically the mainland Guantanamo Bay, one of the worst prisons in the United States? Karima Al-Amin: Right after the conviction of March 2002 the Imam was moved to Southeast Georgia, Reidsville State Prison, and while he was there, he really had a lot of influence especially on the younger inmates. Parents used to come up to us and say they were happy that the Imam was in the same facility because he was really helping their sons. So he was there from March 2002. In 2006 there was an effort by Muslims at Reidsville to have Imam Jamil be the imam for all of the Georgia incarcerated Muslims. When the facility found out about it, they said that would give the Imam too much influence and too much power. And they wanted him to stop the effort even though he hadn’t initiated the effort. But he said, well, it’s no problem, so he said he would ask the Muslim inmates not to go forward with the effort. The FBI then went into the institution and then they ended up coming up with a report, “The Radicalization of Muslim Inmates in the Georgia Prison System.” And right after that at the end of July 2007, Georgia, based on a March 1990 agreement that they had with the Federal Bureau of Prisons, Georgia gave him up to the feds without a federal charge, without a conviction or a sentence. In 2006 there was an effort by Muslims at Reidsville to have Imam Jamil be the imam for all of the Georgia incarcerated Muslims. When the facility found out about it, they said that would give the Imam too much influence and too much power. The FBI then went into the institution and wrote a report, “The Radicalization of Muslim Inmates in the Georgia Prison System.” Georgia gave him up to the feds without a federal charge, without a conviction or a sentence. But to house him, Georgia pays Florence ADX, the Admax, per day for them to keep the Imam there. We have asked for Georgia to take him back. Georgia says that they will not because he’s too high-profile and Georgia also is saying that they had nothing to do with his placement at ADX. They just gave him up to the feds. The feds are saying, well, we’ll send him back. Georgia said yes, and then Georgia said they had nothing to do with the placement – that the feds could have put him in another facility. But this goes back to what we have always said, that he’s still being punished for the ‘60s, that he’s still being punished not only for what he represented in the ‘60s but also now as a Muslim. But he is there locked down for 23 hours in the Florence ADX, which is on every list for being one of the 10 worst prisons in the world, not in the U.S. but in the world, so that’s why we have been attempting to try to have him removed from there. And not only because of it being one the 10 worst in the world, because we feel for all of the inmates who are there, but the fact is that it’s a continuation of an extreme punishment and we all know there are studies that say that after a person is in solitary confinement for five years that there is a psychological damage that is done, so we feel not only for the Imam but for all those who are held in solitary confinement. We feel not only for the Imam but for all those who are held in solitary confinement. M.O.I. JR: Recently, there’s been an alert by the Imam’s defense committee that he was having medical problems that the prison system was not catering to. Can you tell the people a little about the history behind that, what’s going on with the Imam now, and what it is that we can do to help? Karima Al-Amin: Right. It was back in October 2013 when we visited the Imam, we noticed that his jaws were swollen. Apparently he had a dental issue that had not been treated and then when we went back in May of this year, a month ago, we noticed that his jaws were still swollen. He was trying to get dental treatment and they would not give him any antibiotics. He started developing not only chest pains but breathing difficulties. It started becoming very difficult for him to breathe. In addition to that, because of the abscess – because he had developed abscesses – and then the fluids were beginning to drain and go into his lungs, his chest area. He started having the breathing problems; he started to not be able to swallow. So right after we left in May, he put in to see a physician, and to date a physician has not examined him. He has swollen feet – the top and bottom, the ankles, are all swollen – and within the last two weeks he’s lost 25 pounds. So the concern is about what toxic fluids that have seeped into his bloodstream, the breathing. He’s 70 years old. In the prison system now, and I’m speaking about the federal system, the age of the population is increasing. And naturally it’s increasing, because the sentences that people are receiving are life sentences. And although they may not want to have a nursing home, they’re going to have to do something to meet the needs of the elderly. If the prisons cannot address the needs of the elderly inmates, then there’s a need, if they don’t let them out, which is the desired result, then they need to have facilities with adequate medical equipment, premises and medicines to treat the elderly, and that’s what we’re calling for. If ADX cannot address the medical needs of the Imam, we’re asking them to release him to another facility with the adequate resources to take care of the elders. M.O.I. JR: What can people do to help in general with the Imam’s case? Karima Al-Amin: Well, a lot of people have been writing and have been calling inquiring about his health. There is a website you can go on with the federal Bureau of Prisons. You can click on inmates; a lot of people have been doing that. And we have some congressional reps who are also concerned and they have been inquiring. So I think the thing is that when we have those that we care for and love and you have them incarcerated and those in solitary confinement, and your voices can’t be heard, we have to serve as their voice or voices. The Imam has always said to people, do whatever is easy for you. So whatever is easy for a person to at least speak out or inform people, then we would appreciate that assistance. Also people can Google him, they can Google. There are petitions online so we would encourage people to do that. M.O.I. JR: Where do you prefer for people to get more information if they would like to read up on the Imam and his history? Karima Al-Amin: When I get on(line), I just put his name in and things come up every time I do that that I have not even seen before. There are bulks of interviews that he has done with people over the years and I think those are really very informative, and I think it’s important for people to do that. You know we have to educate our young, who absolutely have no idea what some of those who are incarcerated, what they have gone through and why they’re incarcerated. So we really would advise those who are older to try to educate those that are younger so we will have informed people. M.O.I. JR: Thank you, Ms. Al-Amin, for being with us right here on the Block Report. We appreciate you for standing up in your husband’s defense, but not just because he’s your husband but in defense of someone who has given a lot over the last 50-60 years to our communities. So we salute you, we appreciate the Imam’s contributions and hopefully our listeners will get involved with the campaign to free the Imam. Karima Al-Amin: We certainly thank you and we extend our appreciation and our love to those who have been with us for at least the last 14 years of his incarceration and before that. Thank you. The People’s Minister of Information JR Valrey is associate editor of the Bay View, author of “Block Reportin’“ and the newly released “Unfinished Business: Block Reportin’ 2“ and filmmaker of “Operation Small Axe“ and “Block Reportin’ 101,” available, along with many more interviews, at www.blockreportradio.com. He can be reached at blockreportradio@gmail.com. This interview was transcribed by Adrian McKinney. 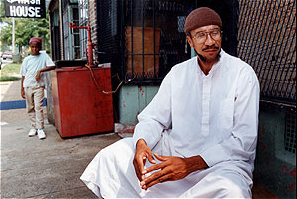 Imam Jamil Al-Amin (H. Rap Brown), the organizers report, is aware of the response to the campaign and sends his greetings and thanks to all who have and are advocating on his behalf. Still there is much to do. Calls and signatures must continue until our beloved brother has received the required medical attention. His release is paramount and we must not cease until he is returned to us and his family a free man. We have made progress. Continue the efforts no matter how small: Call, write, publicize, hold rallies and keep the Imam’s name continuously in the media’s eye. Support this critical effort for a man who fought to make life better for us all. 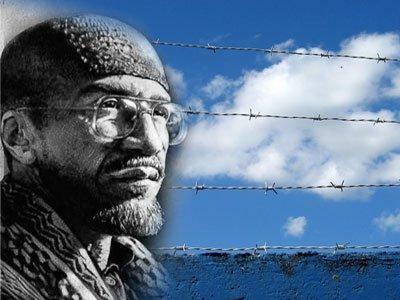 Sign the petition: “The Forgotten Imam: Jamil Abdullah Al-Amin (H. Rap Brown).” As of June 22, the petition has gathered 4,289 signatures, but the Imam’s words and work have helped millions, so spread the word. “Call the Bureau of Prisons, at 719-784-9464, NOW. If you are told that information can only be given to family members, say that you are not asking for information but are simply expressing concern that Mr. Jamil Al-Amin, No. 99974-555, receive the health care he needs. Leave a message if necessary that includes his name and number. We want the Bureau of Prisons to know that the public is concerned, aware and watching their treatment of Imam Jamil. “Create an email and fax flood. Email FLM/execassistant@bop.gov or use the form at http://www.bop.gov/inmates/concerns.jsp (location Florence ADMAX USP). Fax 719-784-5290. In your own words, express concern that 1) Mr. Al-Amin is suffering after-effects of delayed dental care: weight loss, inability to eat, swollen feet, respiratory problems; and 2) he has not been examined and treated by a physician as is absolutely necessary given his condition, and as is his right. “On the Left Side of History: Political Prisoner Imam Jamil Al Amin"
“The Forgotten Imam: Jamil Abdullah Al-Amin (H. Rap Brown)"
“The Radicalization of Muslim Inmates in the Georgia Prison System"
“Unfinished Business: Block Reportin’ 2"
I think this is the courageous and boldest stance that one can do today for the sake of justice is to stand together and unite for human rights and civil liberties and justice for all know matter their circumstances we now fight the powerful powers that be. Nice!! Your blog is very informative. Useful content thanks for sharing. I am impressed that your article is very good and worth reading. the conclusions of your article are very good for the public.